workshop | What is a letter? 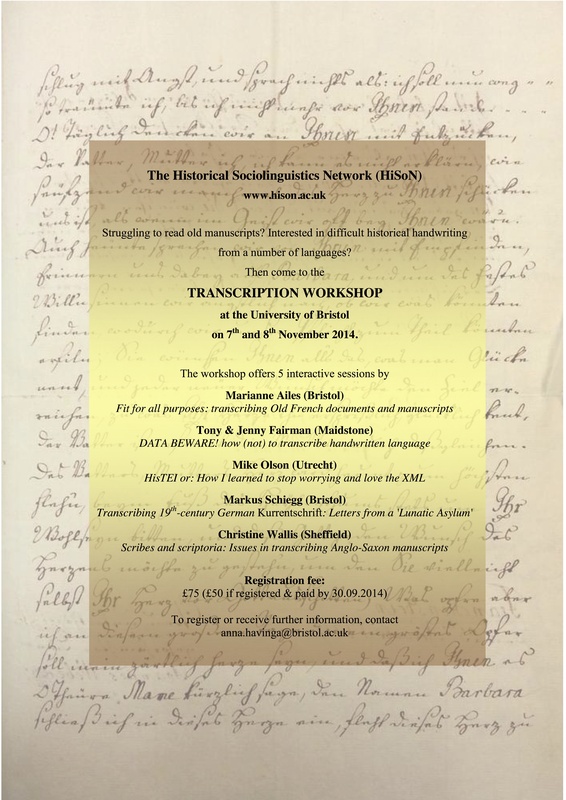 This entry was posted in Workshop and tagged sociolinguistics, transcription, workshop on 11/08/2014 by mis. Detailed information about the programme, fee, etc., is available here. This entry was posted in Conference, Workshop and tagged conference, early modern letter writing, workshop on 09/08/2014 by mis. Letterlocking refers to the process by which a substrate has been folded and secured shut to function as its own envelope. Letterlocking is part of a 10,000 year-old information security tradition, ranging from Mesopotamian clay bullae to internet Bitcoin. Locked paper documents have been used in cultures throughout the world since the late Middle Ages by regents, their secretaries, spymasters, soldiers, and the general public. Oftentimes the same person used more than one letterlocking format, some more secure than others. Why? Documenting the physical evidence – the tiny slits, folds, and cut-off corners – of well-preserved ‘opened’ original manuscripts helps to define their different ‘closed’ locking formats. Collaboration with experts in allied professions helps to figure out the significance of letters as artifacts in a specific moment in history. Jana Dambrogio is the Thomas F. Peterson (1957) Conservator for Massachusetts Institute of Technology’s Library in Cambridge, Massachusetts, USA. 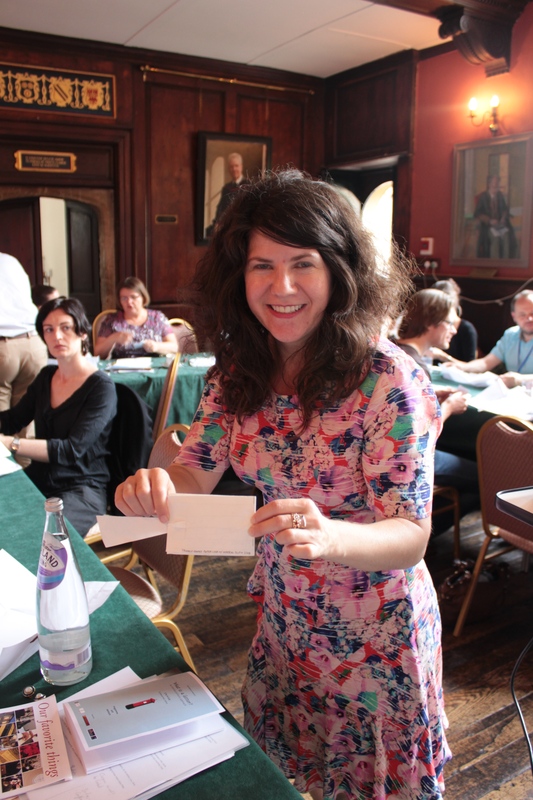 Her work with Dr Daniel Starza Smith of Lincoln College, Oxford, on John Donne’s letterlocking techniques brought her to Oxford for Smith and Dambrogio’s participation in the international symposium ‘What is a letter? An interdisciplinary approach’ in Oxford this past July. Jana lectures and teaches workshops internationally on her process of making models to understand the physical nuances of historic letters and archival bindings and discusses how conservators preserve their function and format for access and interpretation. 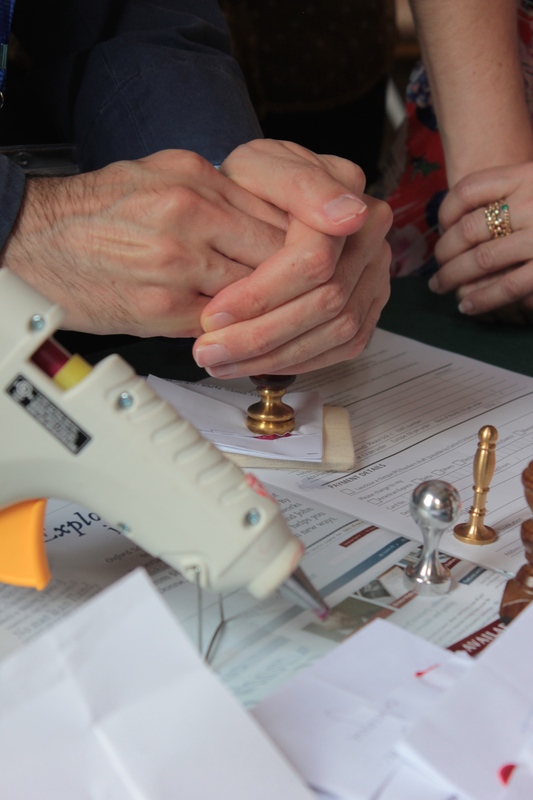 Workshop participants have a hand at ‘un-locking’ and securing shut models of several types of locked letters with varying levels of built-in security devices based on historic examples. 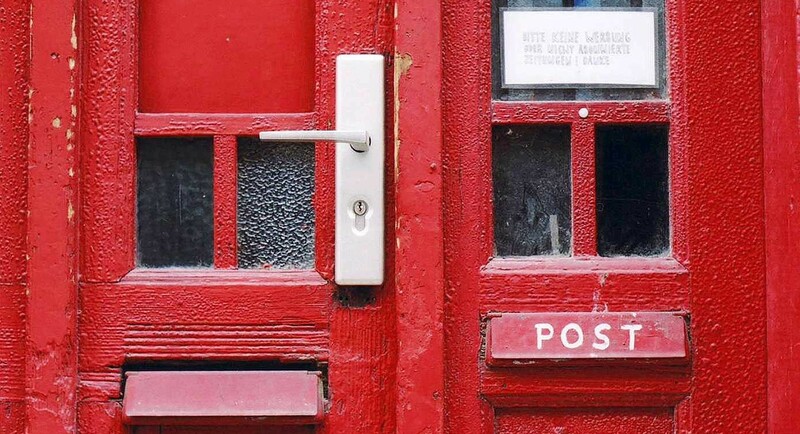 Resources are available on a letterlocking website and a YouTube channel which feature a growing reference collection of documents and bindings in motion. PS from MI Matthews-Schlinzig: There is another great blog post on this topic, ‘Let’s make a model’, which was co-written by Dr Heather Wolfe (Curator of Manuscripts at the Folger Shakespeare Library) and Jana Dambrogio. 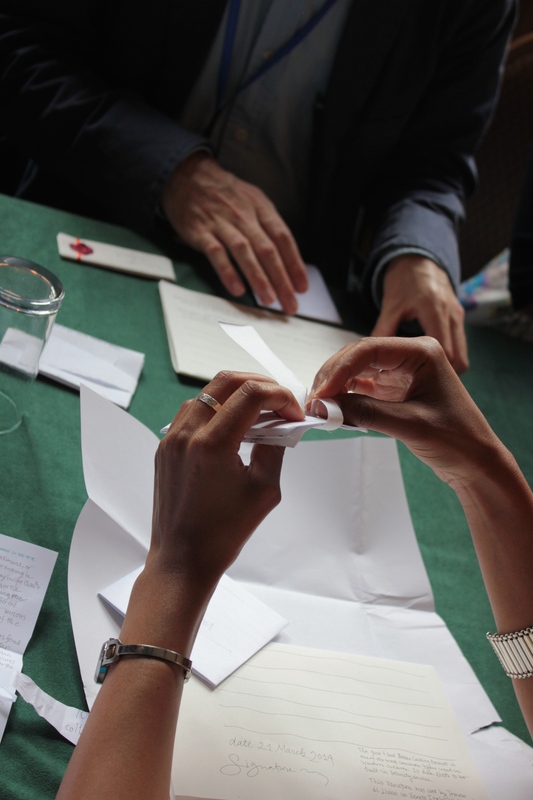 The photos in this post were all taken at the letterlocking workshop Jana Dambrogio and Dr Daniel Starza Smith gave at the symposium ‘What is a letter? An interdisciplinary approach’. 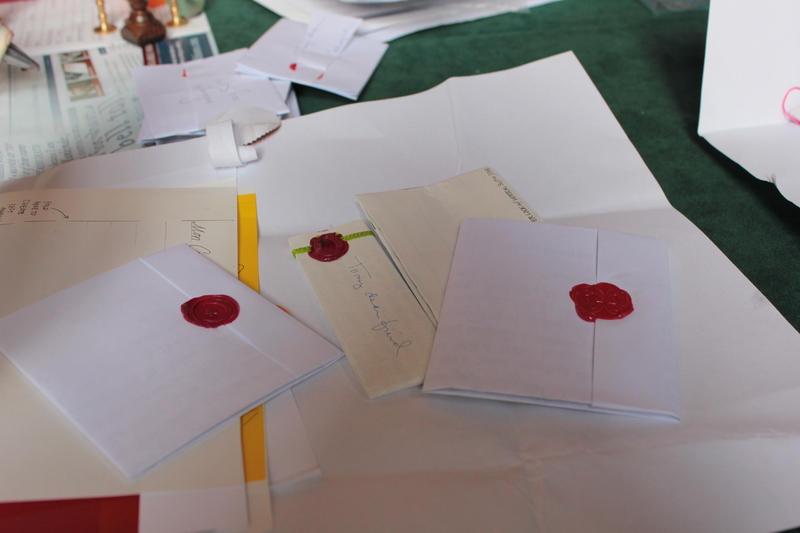 This entry was posted in Guest post and tagged conference, letter writing, letterlocking, materiality, workshop on 04/08/2014 by mis. Please email us if you have any problems accessing the pdf or any general questions. This entry was posted in Workshop and tagged letter writing, materiality, registration, workshop on 12/06/2014 by mis. “Nach Amerika!” — in der Zeit von 1820 bis 1930 folgten ca. 6 Millionen Deutsche diesem Ruf und machten somit das lange 19. Jahrhundert zum Zeitalter der Massenauswanderung. Innerhalb dieser Zeitspanne werden ca. 250 Millionen Briefe zwischen Amerika und der alten Heimat ausgetauscht. Diese Auswandererbriefe zeugen bis heute von den vielfältigen Beweggründen für Auswanderung, von Problemen und Krisen während der Integration in die ,Neue Welt’, sowie von Konfrontation mit der fremden Kultur und der damit einhergehenden Reflektion des Eigenen. Von der Bedeutung der Auswandererbriefe für die Kultur des 19. Jahrhunderts zeugt darüber hinaus das zahlreiche Aufkommen von Auswandererbriefen in den verschiedensten Medien. Nicht nur in Auswandererperiodika und -ratgeberliteratur, wo Briefe zu Werbezwecken für die Auswanderung abgedruckt wurden, sondern auch in Zeitungen, illustrierten Familienblättern, Volkskalendern und politischen Pamphleten werden Auswandererbriefe medial verbreitet. Zahlreiche Stiche und Gemälde zeigen darüber hinaus Leseszenen von Auswandererbriefen. Und nicht zuletzt greifen literarische Texte in vielfältiger Art und Weise auf Auswandererbriefe als Element ihrer Erzählung zurück, wodurch die ,Briefe aus Amerika’ in einen fiktiven Rahmen gerückt werden. This entry was posted in Workshop and tagged CA, emigrant letters, workshop on 18/05/2014 by mis. Registration deadline: contact Anne Baillot (anne.baillot@hu-berlin.de) by 5 May 2014. This entry was posted in Conference, Workshop and tagged CA, editing, workshop on 29/04/2014 by mis.